During my last visit with my grandma, she showed me how easy it is to make your own Chinese salted eggs! Chinese salted eggs are simple, delicious, cost-efficient side dishes. Personally, I find them addictive. They can be enjoyed as a side dish to compliment a plain bowl of white rice or congee, or they can be used to flavour many different Asian dishes; just to name a few: steamed egg dish, claypot rice, steamed minced pork, rice dumpling (joong/zhong zi), etc. You can even add salted eggs to simple Chinese vegetable soups. This recipe makes a very large amount, which is perfect for making a large batch of Chinese rice dumplings (joong / zhong zi). Feel free to scale it down if you’re not making rice dumplings. My family never has trouble finishing a batch. Note that Chinese salted eggs are usually made with duck eggs, but if fresh duck eggs are hard to find where you live, chicken eggs taste delicious too. You might be lucky enough to find a local farmer that sells fresh duck eggs. Optional: 1/2 Chinese soup spoon potassium carbonate (preferred brand: Koon Chun; this comes in a transparent liquid, bottled); Note that this only serves to make the yolks more firm. Firmer yolks are ideal for Chinese rice dumplings and some other dishes, but potassium carbonate is by no means necessary. In a sterilized glass or ceramic jar that is large enough to hold all of the eggs, dissolve the salt completely in some cold water. If the salt does not dissolve completely, then the eggs on the bottom of the jar will be saltier than the ones on top. Then place the eggs in the jar and fill the jar with enough cold water to cover the eggs. Add the potassium carbonate solution (if using) and screw on the lid of the jar. Store at room temperature in a cool, dark place (or in the refrigerator) and allow them to sit for at least 40 days. The longer they soak in the salt water, the saltier they will get. When they’re ready, you can remove them from the solution and store them, dried off, in the refrigerator. Note that the salted eggs will still be raw. So, if you’re eating these as a side dish, boil or steam them until just cooked through (the same way you would normally boil or steam a regular egg). Peel the shell and serve hot or cold. Or you could simply place a salted egg or two in a pot of uncooked rice and water to cook together. Often, we will use a sharp, serrated knife to swiftly (in a single, continuous straight down motion) cut the egg in half lengthwise instead of peeling the egg. 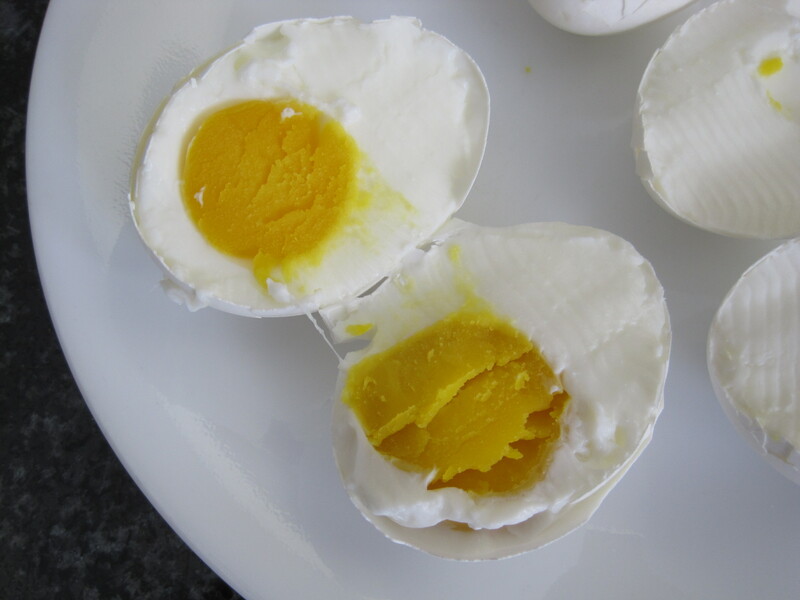 If you’re using these salted eggs as an ingredient for an Asian dish, crack open the shell and use the raw egg. That was So nice of you! Thank you very much for the nomination! I really appreciate it 🙂 I hope you have a great day! Hi, I don’t know if you remember me but I come visit you when I’m looking for ‘the best.’ Came looking for brownies this time after trying three recipes I didn’t like; will try the one that won out of 15 you tried. Also see that you moved! Missed that, and hope you’re enjoying a new scene. About salted eggs. I like them with steamed minced pork. Mmmm! Of course I remember you 🙂 I’m so glad you stopped by again! And thank you for such a nice comment 🙂 I’m loving rediscovering Toronto, but I definitely miss the life that I built over the past 5 years. I also love salted eggs with steamed minced pork 🙂 Do you ever put salted eggs into your Chinese vegetable soups?